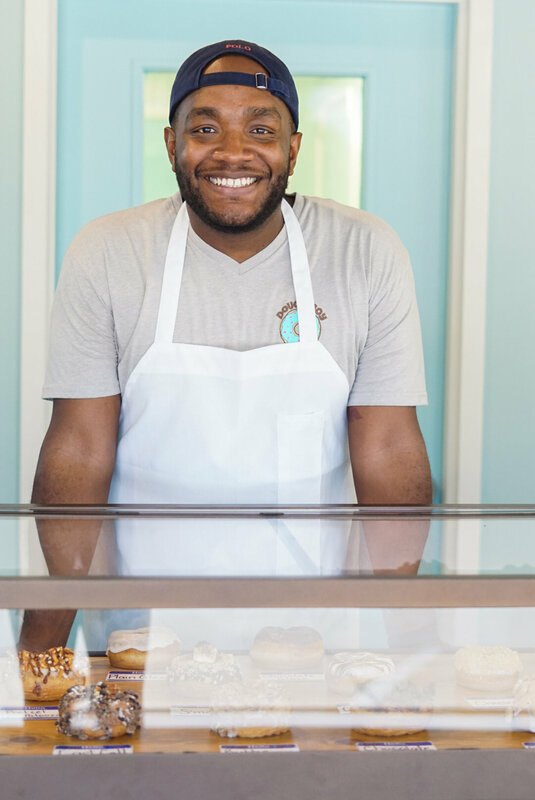 Melvin Roberson, owner of Dough Boy Donuts, began his entrepreneurial quest in late 2014. The idea of Dough Boy Donuts came after 15 years of restaurant experience, and a desire to build a company of his own. His culinary skills were sharpened after several years of kitchen management for a well known steakhouse. His leadership abilities flourished and his creative fuse burned bright. Melvin began experimenting with homemade donut ingredients; and eventually created a unique, made from scratch donut recipe second to none. After months of perfecting his craft, Melvin set out on North Texas’ first donut food truck. Dough Boy Donuts took DFW by storm and was embraced with open arms. In the summer of 2018, Melvin’s dream of brick and mortar developed into a reality. Dough Boy Donuts opened its doors to the public in August. Since 2014, Dough Boy Donuts specializes in dough that is made from scratch, in-house daily. We roll, cut and fry donuts fresh throughout the day ensuring that warm donuts are regularly available and no donuts are dressed until you order them! In addition to rolling into various food truck parks across North Texas, think outside the box and bring Dough Boy Donuts to you. The truck is available for public events, community gatherings, private parties, church functions and more.